The laws of physics don’t apply in Toontown, where cartoon characters live and SUVs act like sports cars. In Toontown, Infiniti‘s new FX50 accelerates quicker than a G37, matches its outstanding braking performance, and then – as its pièce de résistance – rounds corners even more quickly than the sport coupe. The story is similar with Toontown’s – it sticks with the twin-turbo 335i coupe in a straight line and can almost match its performance-benchmark prowess in braking and cornering. Here in the real world, height and weight are the biggest enemies of acceleration, braking, and handling. 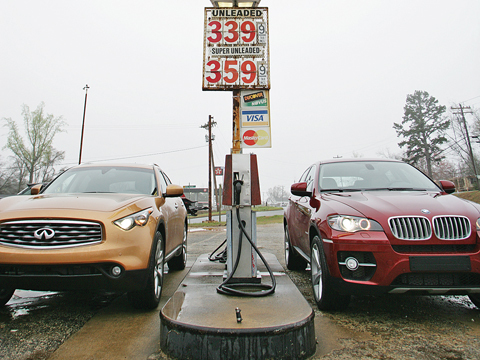 So how is it that these tall, heavy SUVs can dance with their low-slung coupe siblings? Cue the Looney Tunes music. The 2003 Infiniti FX wasn’t the first SUV with performance credentials – the and the had already proven that even elephants could do ballet. However, the low-roofed, big-wheeled FX was the first SUV that looked the part, sacrificing utility for a lot of sport. Infiniti’s all-new 2009 FX has fallen victim to the latest styling trend: lots of fussy details tacked on to what was a clean, uncluttered design. 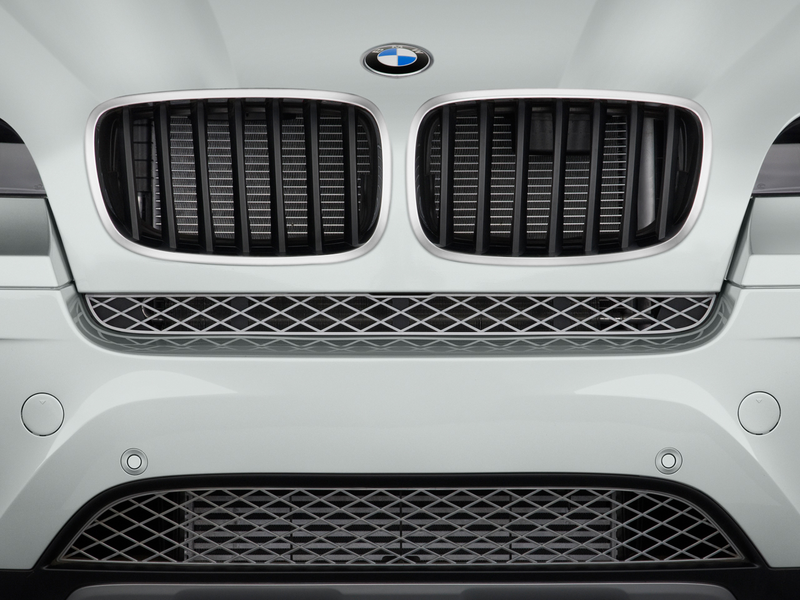 Witness the angry-crocodile headlights, the clichéd (but functional) fender vents, and the bizarre grille treatment. Thankfully, the new FX keeps the original’s stunning Elroy Jetson sports car proportions, which is what you first notice when you see one on the road. The second-generation FX is two inches longer than the model it replaces, riding on a wheelbase that has been stretched by 1.4 inches. Most of the additional length is forward of the windshield, so space for the FX’s five occupants – especially those in the back seat – is still as tight as it was last year, and cargo volume is even less than before. Despite significant increases in rigidity, the FX’s new chassis is actually 200 pounds lighter than the previous generation’s. Overall weight has increased due to additional content – but only by about 70 pounds. 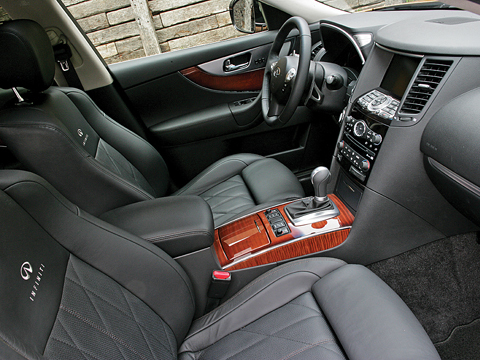 Infiniti took no chances with the FX’s interior – the cockpit is elegant and formal, with diamond-pattern stitching and embroidered logos in the seats. The curved wood inserts in the door panels are particularly beautiful, stained darker at their edges and punctuated with thin chrome surrounds. Most everything you touch feels rich (which was not necessarily the case with the last FX), from the magnesium shift levers to the weighty gear selector. Like before, the FX is available in two trim levels. The V-6-powered FX35, which should start at about $41,000, receives an updated 303-hp, 3.5-liter V-6 from the G35 sedan. This high-revving six makes 28 hp more than the engine in last year’s FX35 and, in conjunction with a brand-new seven-speed automatic transmission, promises acceleration close to that of the V-8-powered FX45. It won’t be stepping on any toes, however, because Infiniti has replaced the FX45 with the FX50. For about $56,000, the FX50 comes with an updated and enlarged 5.0-liter V-8 that produces 390 hp and 369 lb-ft of torque (see Techtonics sidebar). The new V-8 retains all of the qualities that made us fall in love with the last one – linear power delivery and a primal wail straight out of the Italian mountains. With the help of the new seven-speed automatic, the FX50 not only provides better fuel economy than the FX45, it destroys it at the drag strip, too. The FX50 recoils in rage and explodes off the line, hitting 60 mph in 5.4 seconds – a full second quicker than the last FX45 we tested; 100 mph is yours in only 13.1 seconds, an incredible 4.6 seconds quicker than before. To put this performance in perspective, the FX50’s acceleration numbers are identical to those of a S.
Luckily, the FX50 isn’t all engine and no chassis. 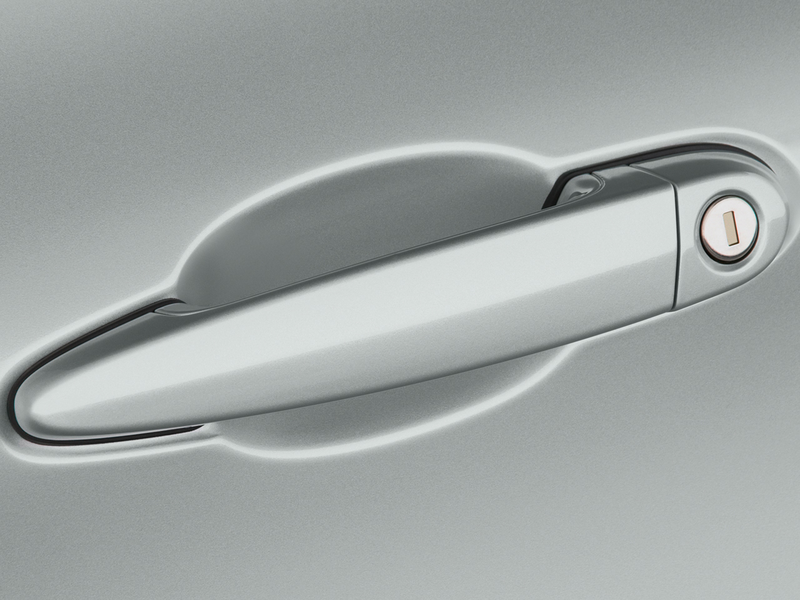 Its steering is quick off center, beautifully weighted, and offers plentiful feedback. Our sport-package-equipped test car benefited from Infiniti’s rear active steering, which uses an electric motor to turn the rear wheels up to one degree. The result is lightning-quick turn-in and tremendous confidence behind the wheel. 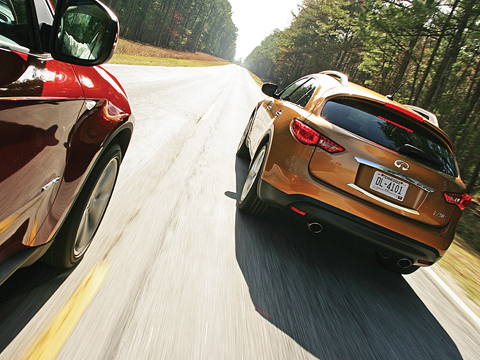 The FX45’s biggest shortcoming was an overly harsh ride, and Infiniti has addressed this problem by including Continuous Damper Control in the FX50’s sport package. CDC adjusts the shock absorbers in response to changing road conditions, so the new FX’s ride is much less harsh – despite huge, twenty-one-inch wheels – and body motions are even better controlled. 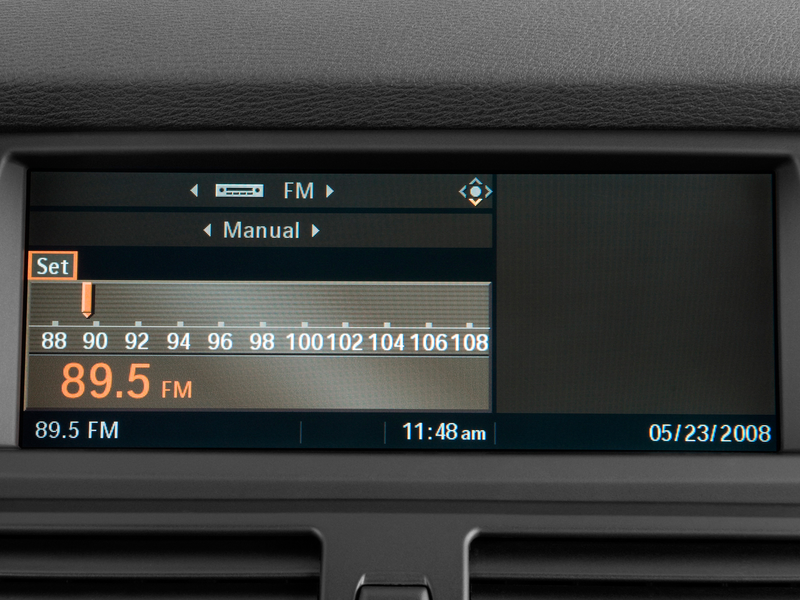 Our FX50 test car also was equipped with the technology package, which adds a host of buttons with indecipherable acronyms. 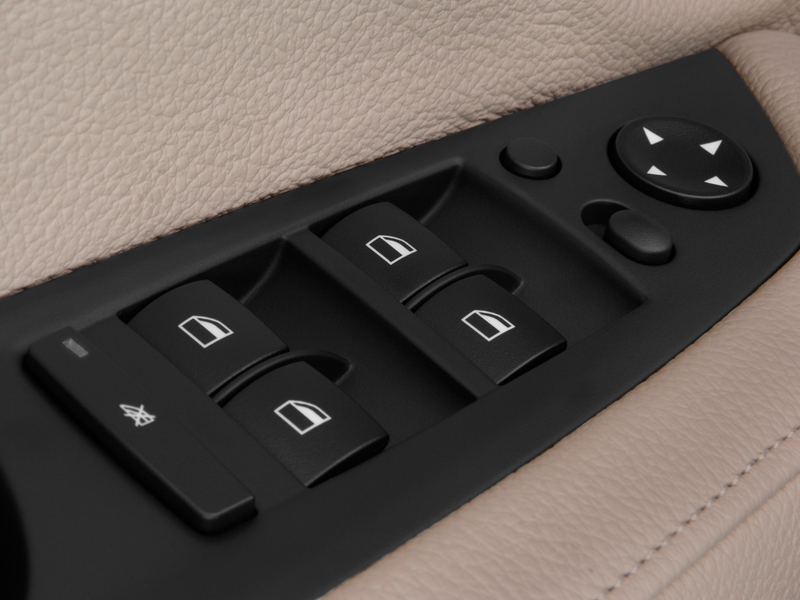 Boiled down to English, the buttons control three systems that use a front-mounted laser sensor: Intelligent Cruise Control, which now can bring the vehicle to a complete stop; Distance Control Assist, which applies the brakes automatically, making low-speed traffic conditions a one-pedal operation; and Intelligent Brake Assist, which beeps at the driver and then automatically applies the brakes to lessen the severity of an impact. The tech package also includes Infiniti’s Around View Monitor and Lane Departure Prevention systems. Fully loaded with every available option, our FX had an estimated sticker price of $62,000, which seems expensive only until you look at the BMW‘s pricing. Like the Infiniti, the X6 is available in two trim levels; the $53,275 xDrive35i uses the sonorous 300-hp, 3.0-liter twin-turbo in-line six familiar from the 1-, 3-, and 5-series. The xDrive50i model starts at $63,775, but our fully equipped tester shocked us like a party buzzer with an estimated price of more than $80,000. That’s a lot of money for a large truck with radical styling and only four seats. BMW knows this and acknowledges that the X6 is a low-volume, niche-market vehicle. The company expects to find homes for fewer than 10,000 X6s per year, compared with 30,000 X5s. Infiniti, on the other hand, hopes to sell 20,000 FXs annually. 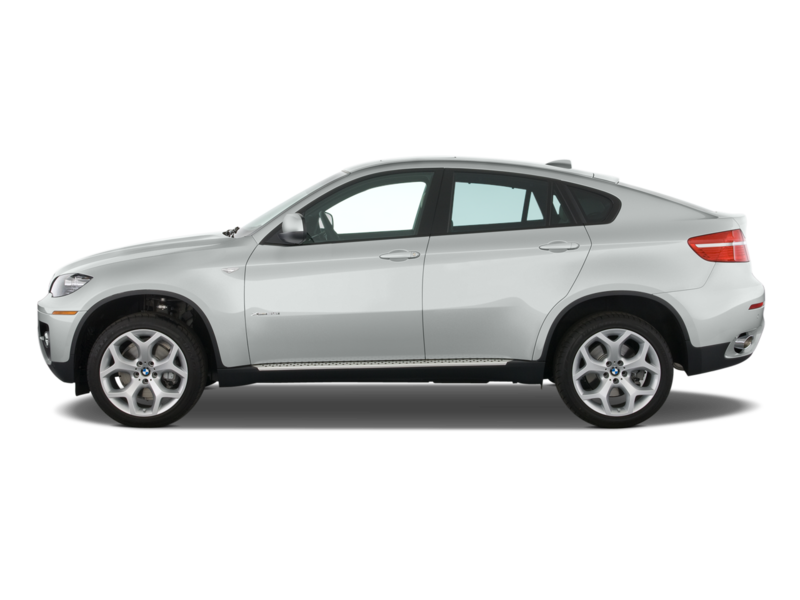 The X6, although based on the X5 SAV (BMW-speak for “sports activity vehicle”), isn’t an SUV at all. Nope, BMW says it’s an SAC – a “sports activity coupe” – a new type of vehicle that’s designed to appeal to buyers who would want a 6-series, had they not gotten used to their SUV’s high seating position. So the SAC is the post-SUV SAV, if you catch their drift. We did – kind of – but still don’t get the AMC Eagle styling and the fender gaps big enough for another set of wheels. The X6 would look a lot better with a three-inch lowering kit – but then BMW would have to concoct some other three-letter acronym to describe it. 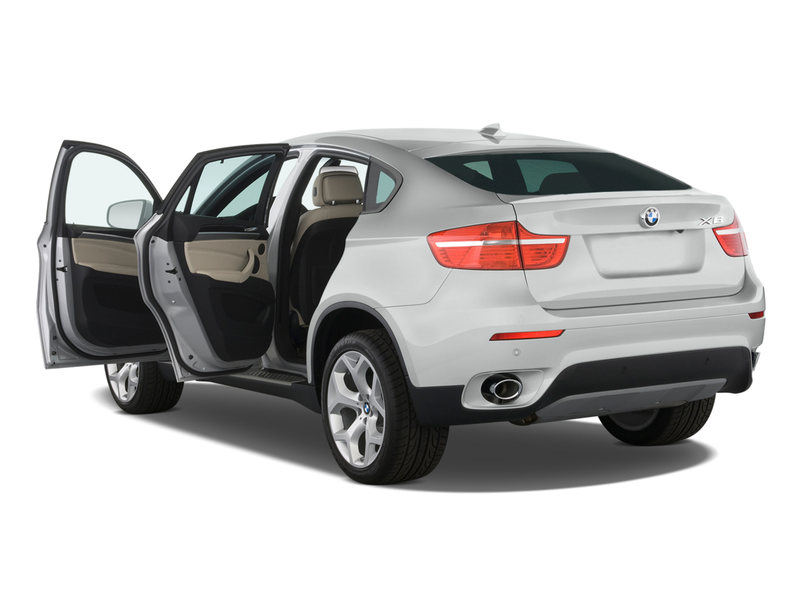 SUV, SAC, or whatever, the X6 measures within an inch or two of the FX in every key dimension, inside and out. 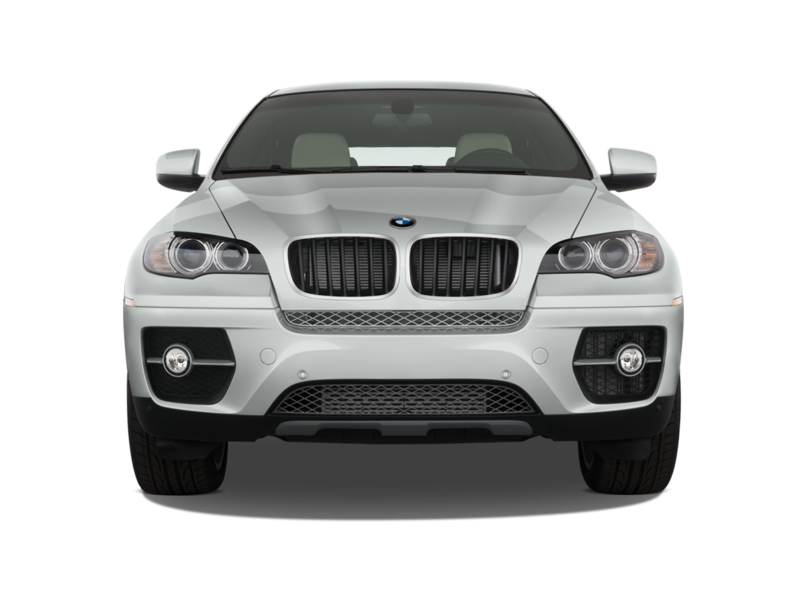 The X6 shares its wheelbase with the seven-passenger X5 but is about an inch longer, two inches wider, and three inches lower. Its radically sloping roof gives the impression that the rear seats are uninhabitable – but that’s not the case at all. 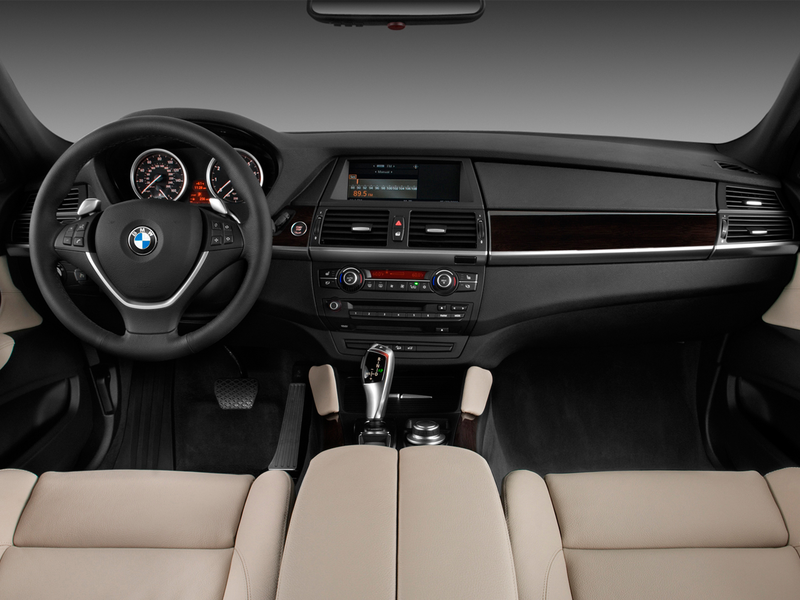 In fact, rear headroom suffers by only 1.2 inches compared with the X5, and the X6’s rear seats are quite comfortable. 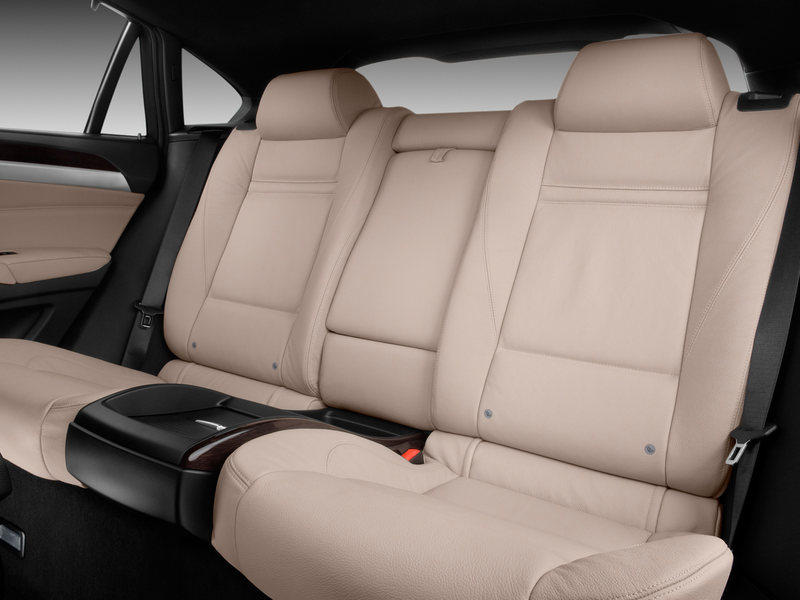 You won’t mistake legroom for that of a long-wheelbase 7-series, but four adults wouldn’t be uncomfortable taking a long trip in the X6. 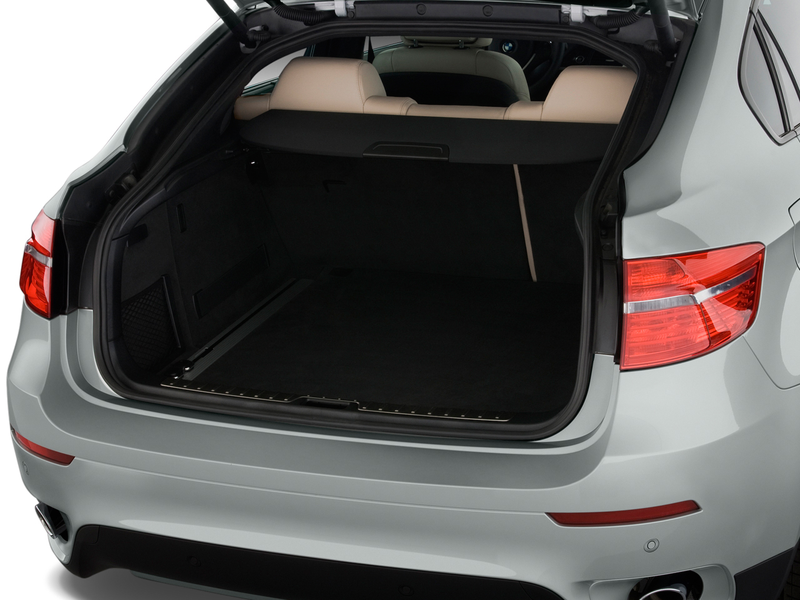 Their luggage would fit, too – the X6 actually has more cargo space than the X5 (and even the FX) with the seats up. 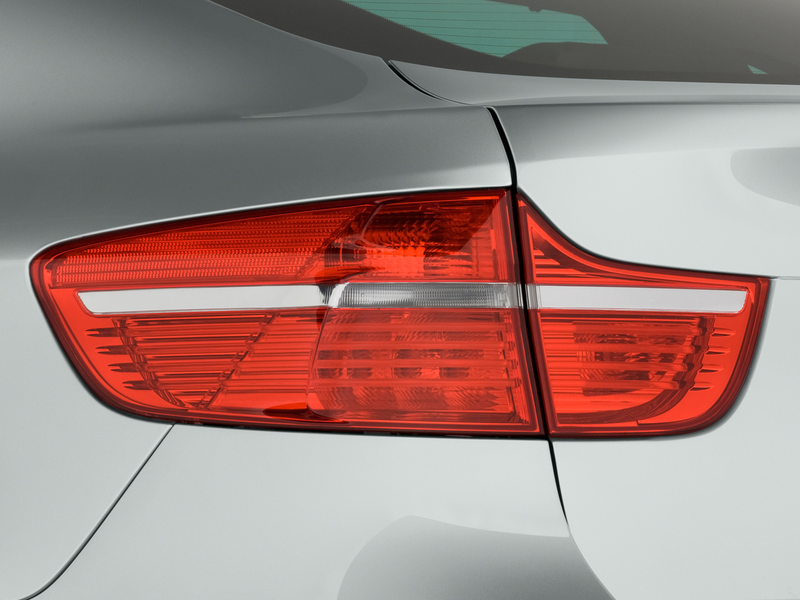 Of course, the sloping rear hatch means that tall items – like a washing machine – won’t fit as easily. That’s what rental trucks are for. 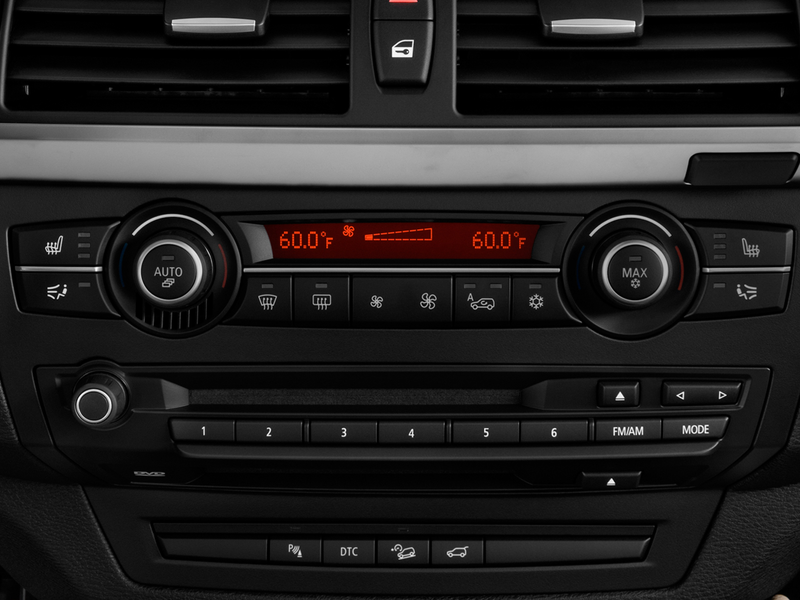 Up front, the X6 shares its basic dash layout, as well as its comfortable driving position and clear, easy-to-read instruments, with the X5. 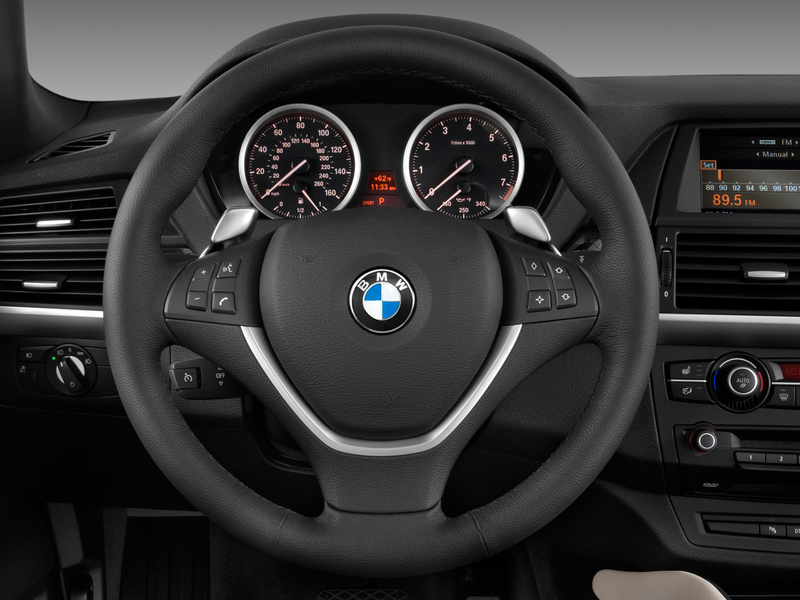 The controls are modern BMW, which means that the steering wheel is delightfully thick and offers excellent steering feel. The dreaded iDrive controller now has lost its ability to give force-feedback, making it even less intuitive than before. 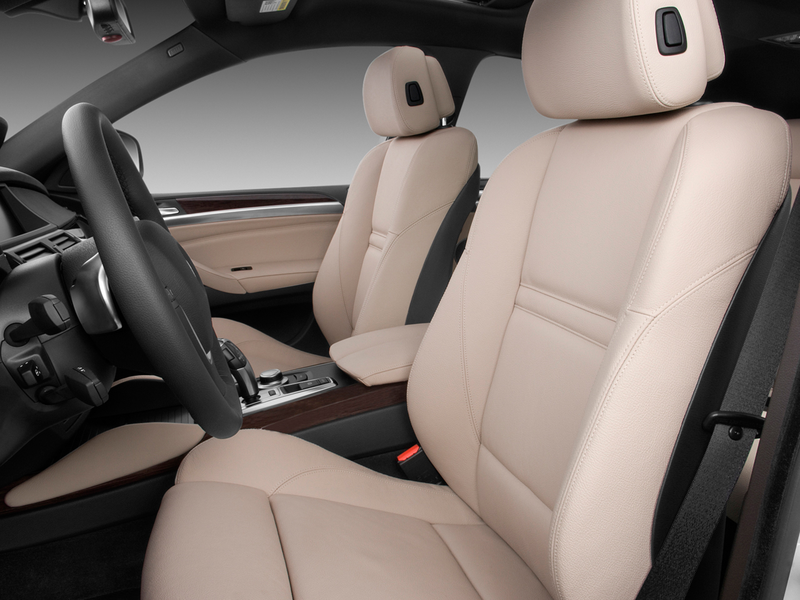 However, our test vehicle’s optional leather-covered dashboard was beautifully upholstered, and the contrasting light-colored seats gave extra flair to what is otherwise a very all-business cabin. 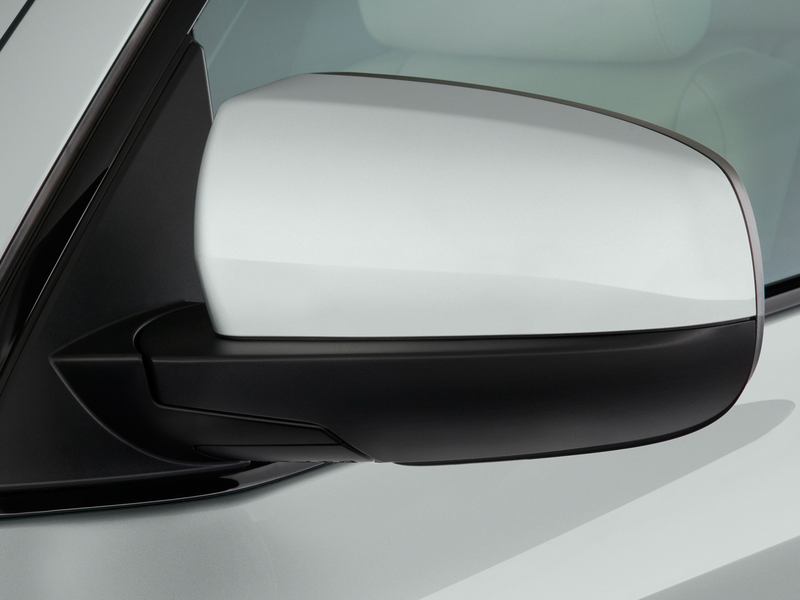 We highly recommend the optional rearview camera, since the X6’s mail-slot rear window could obscure the large building you’re about to back into. Under the hood is an all-new, 4.4-liter twin-turbo V-8 that produces 400 hp and 450 lb-ft of torque. 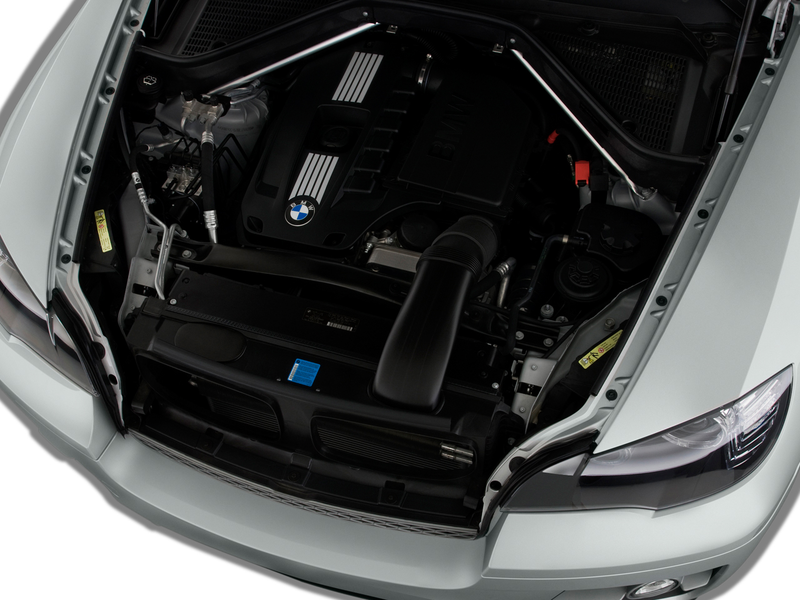 BMW says that locating the turbochargers in the valley of the engine block (see Techtonics) helps reduce lag, but unfortunately, the V-8’s throttle response is anything but linear. Off the line, moderate pedal inputs are met with lazy nothingness, followed by way more power than you thought you asked for. The new engine may be a packaging marvel and may have a broad torque plateau, but to the driving enthusiast, it’s no match for Infiniti’s normally aspirated music box. 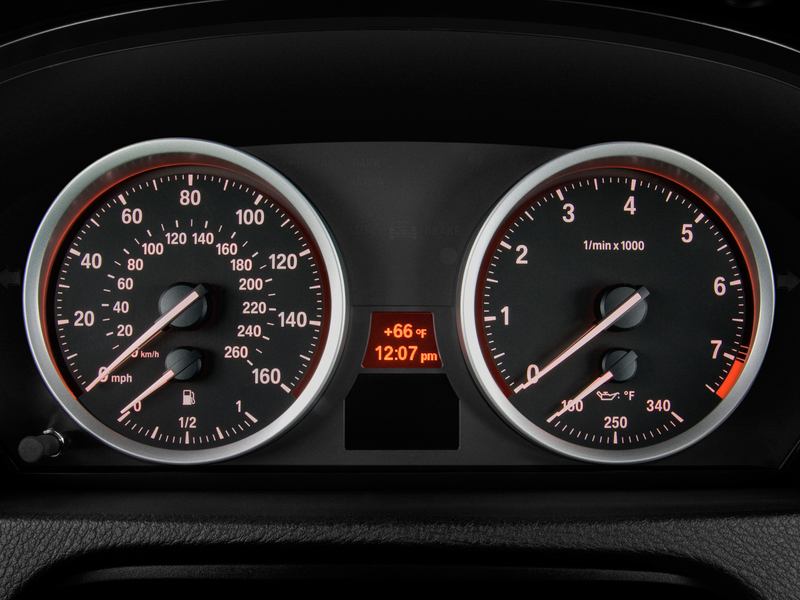 The X6’s blistering acceleration, however, leaves nothing to complain about. It’s slightly faster than the FX50, beating the Infiniti to the 60-mph and quarter-mile markers by 0.3 second. With 10 additional hp and 81 more lb-ft of torque, we expected the BMW to be even quicker – until we learned its weight. At 5270 pounds, even the strongest Toontown passenger-car scales explode – sending springs and dials flying in every direction – at the mere suggestion of weighing an X6. The FX50, a heavyweight itself, is 722 pounds lighter. The X6’s ride is even more supple than the FX50’s, thanks to active antiroll bars and BMW’s EDC system (computer-controlled dampers similar to those in the Infiniti). But whereas the remainder of Infiniti’s techno tricks are gizmo driver aids, the BMW has one last go-fast rabbit to pull out of its hat: Dynamic Performance Control. 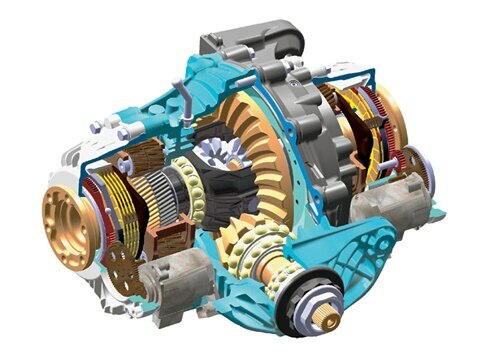 DPC is a new active rear differential that can shuffle engine torque (or engine drag) between the two rear wheels. 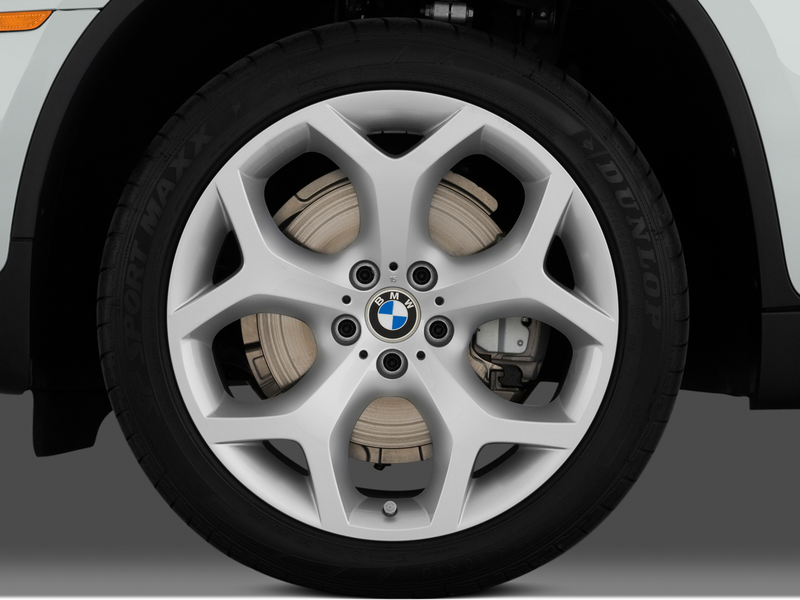 Similar in concept to other torque-vectoring systems, DPC works in concert with the X6’s xDrive all-wheel-drive hardware to apportion engine torque to the wheel or wheels that can best deal with it. DPC works at all speeds, not just during insane cornering, and it helps steer the car using the rear wheels even in normal driving. 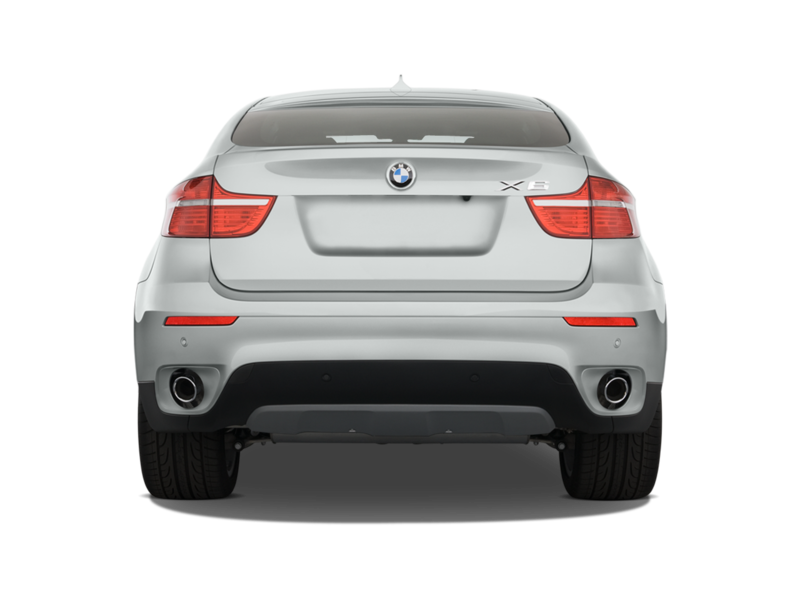 As a result, the X6 feels hundreds of pounds lighter on its feet than an X5. The biggest breakthrough of DPC, however, is how it interfaces with DSC (stability control). Rather than cutting power and applying brakes to steer the car, the combined systems first try to correct the X6’s path using torque vectoring. The result is that the vehicle simply turns smoothly, without the sometimes violent brake interventions and frustrating power reduction we’ve come to expect when the stability control light is flashing. The X6’s performance on a racetrack is downright shocking. BMW says that it will lap the Nürburgring in just over eight and a half minutes – only a few seconds slower than the last M3. That kind of performance is, thankfully, irrelevant to the X6’s intended audience – frankly, the idea of empty-nesters drifting a 5300-pound SUV at speeds on public roads is downright horrifying. If the X6’s buyers don’t take it to the track, then it’s left to win buyers on its looks alone. And that doesn’t bode well. The FX50 makes more sense to us – with nearly identical performance, five-passenger seating, and a lower price, it clearly will appeal to more buyers. With brakes similar to those on the 900-pound-lighter G37, though, it experiences significant brake fade. That’s but one example of the inevitable. Both of these tall, corpulent trucks look – and perform – like they’re from Toontown, but they’ll be driven on earth, where the laws of physics apply. With a little electronic sorcery, each vehicle dupes its driver into thinking he’s behind the wheel of a sport sedan. But that’s an illusion; a cartoon, if you will. Remember what your mom always said – don’t try to do what they do in the cartoons, or you might get hurt. When General Motors suspended development of its UV-8 (the U stood for ultra), several pundits prematurely wrote obituaries for all V-8s. 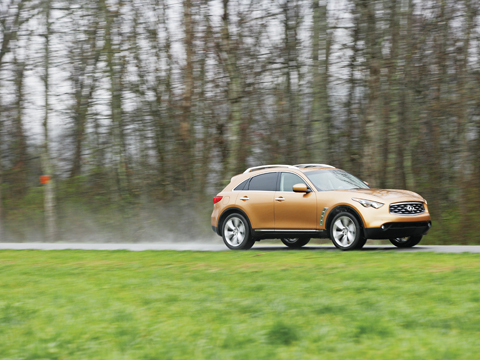 Confirming that there’s plenty of life left in this popular configuration, BMW and Infiniti have both tooled up fresh V-8s for their newest and most sporting SUVs. 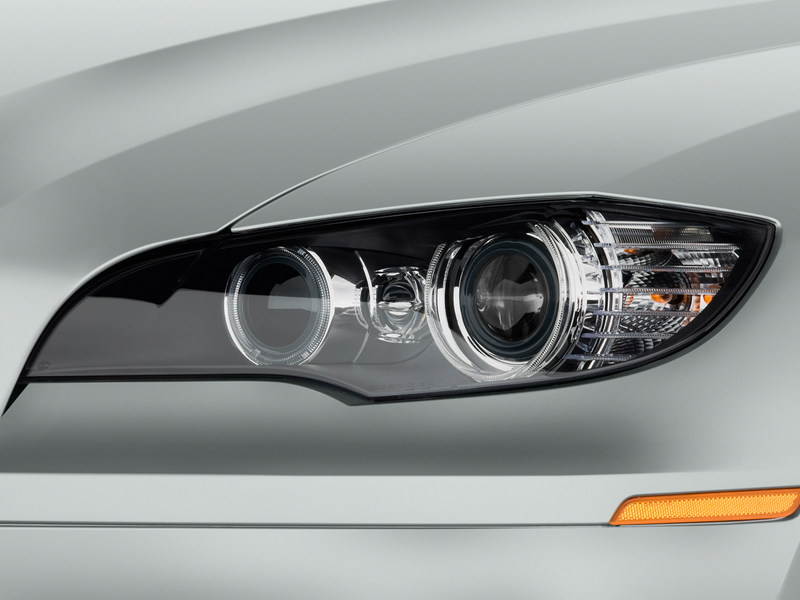 BMW’s 4.4-liter N63 V-8 is the more clever of the two. This is not only a clean-sheet design, it also employs a revolutionary layout: cylinder heads rotated 180 degrees to relocate the exhaust ports to the center of the V and the intake ports to the heads’ outboard flanks. This shuffle concentrates exhaust heat in one location to maximize the energy available to spin two turbochargers. Shorter exhaust passages also diminish the heat lost to radiation, thereby reducing the time required to warm the catalytic converters – also located in the engine’s valley – to proper operating temperature. 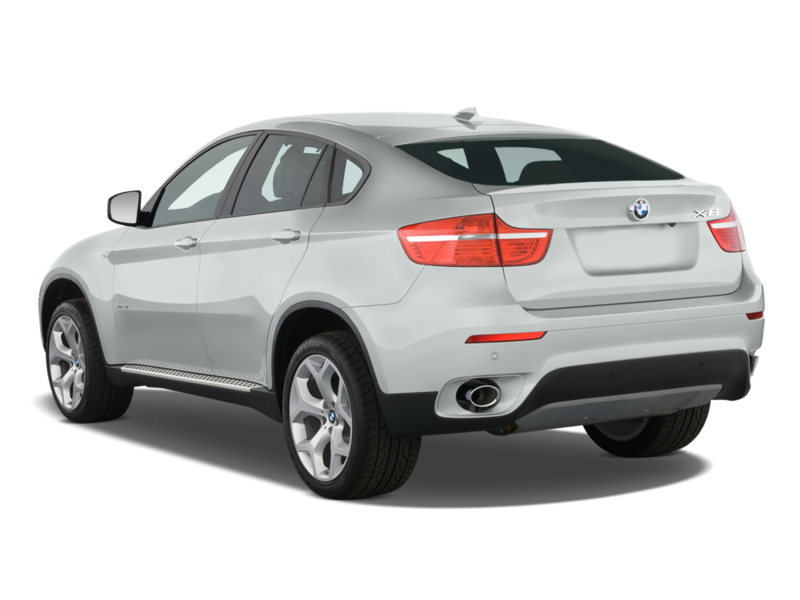 The third benefit is a taller, narrower package that fits not only the high-riding X6 but also BMW’s larger cars. To avoid singeing the paint, there is ample insulation between the hot engine parts and the hood. 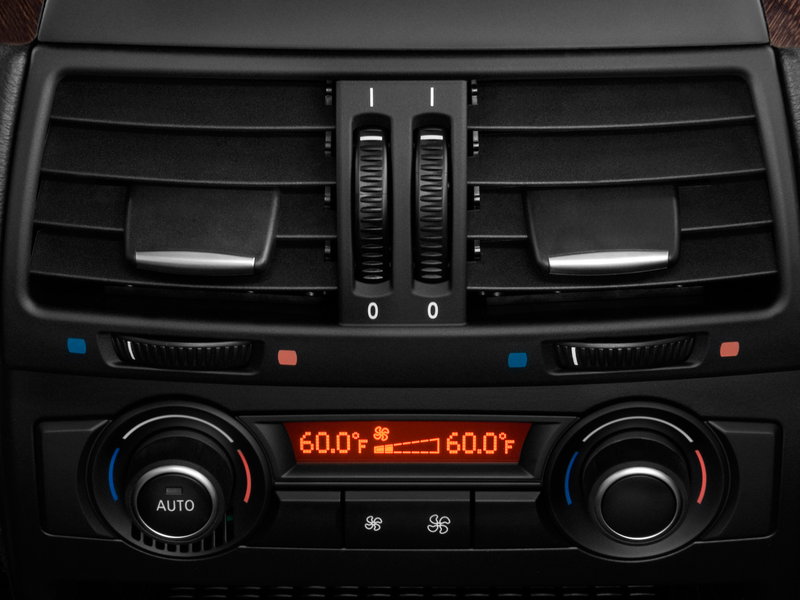 Also, the X6’s cooling fans run if necessary when the vehicle is parked to flush residual heat from the engine compartment. Direct fuel injection, nearly equal bore and stroke dimensions, a 10.0:1 compression ratio, variable valve timing (intake and exhaust), and a peak turbo boost of 11.6 psi yield impressive output figures: 450 lb-ft of torque at only 1750 rpm and 400 hp at a hearty 6400 rpm. 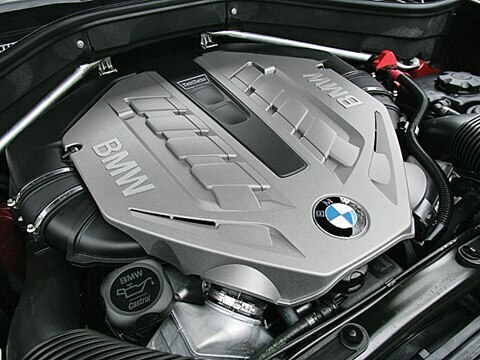 Watch for the new N63 V-8 to systematically replace the 4.8-liter V-8 BMW fits elsewhere. Infiniti’s new VK50VE V-8 is not an all-new design, but it does bring an impressive résumé to this sport-SUV fracas. In addition to an aluminum block and heads, four camshafts, and four valves per cylinder, this engine uses variable intake valve lift instead of a throttle plate to regulate load. Doing so minimizes throttling losses and improves cruising fuel efficiency. 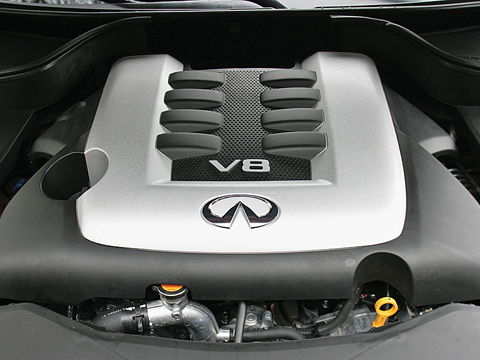 The VK50VE’s Variable Valve Event and Lift System, first employed on the Infiniti G37‘s V-6, has a computer-controlled electric motor driving an intricate adjustable-lift mechanism. Packing a full 5.0 liters (but no turbos or direct fuel injection), the new-wave Infiniti V-8 has a torque peak of 369 lb-ft at 4400 rpm and a competitive 390 hp at 6500 rpm. One last technical feature worth mentioning is BMW’s new Dynamic Performance Control (DPC), a fancy name for the X6’s active rear differential. Two planetary gear sets operated by two computer-controlled clutches help steer the vehicle by increasing the amount of torque delivered to one rear wheel. When the issue is excessive understeer, more torque goes to the outboard rear wheel. In the event of oversteer, the inside wheel receives the boost. 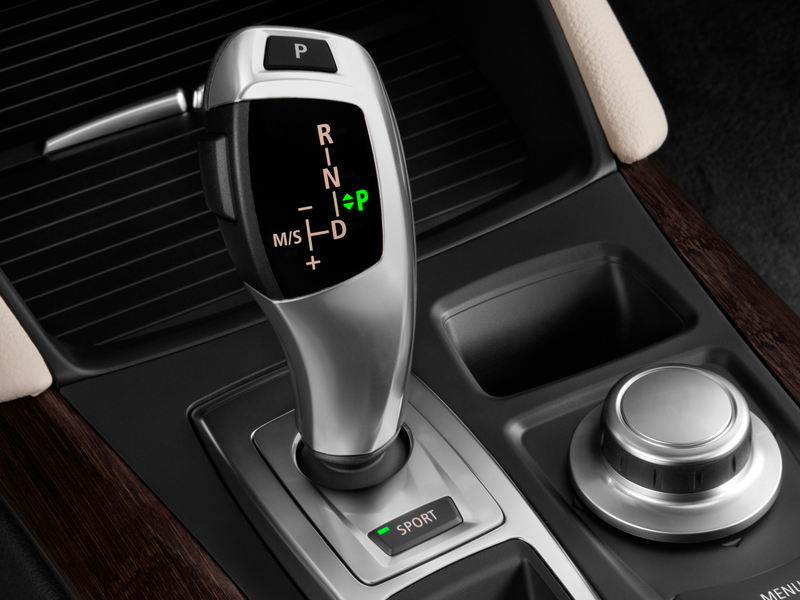 According to BMW, DPC also improves steering precision and stability when the driver abruptly lifts off the accelerator. NA / 59.7 cu. ft. The craziest thing about the X6 is that BMW actually found a way to eke out even more performance from this huge lump. 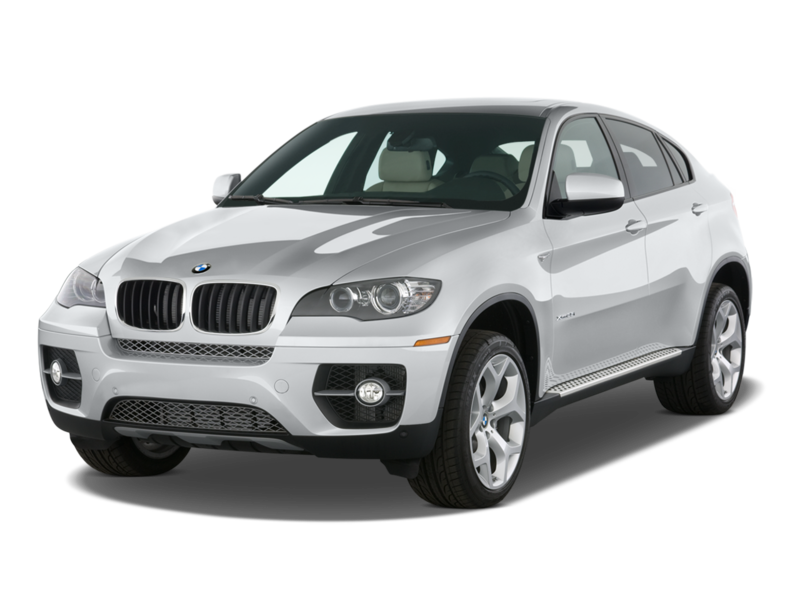 The X6 is like BMW’s X5 SUV with a little more sport and a bit less utility. We’re still not sure what to make of it. 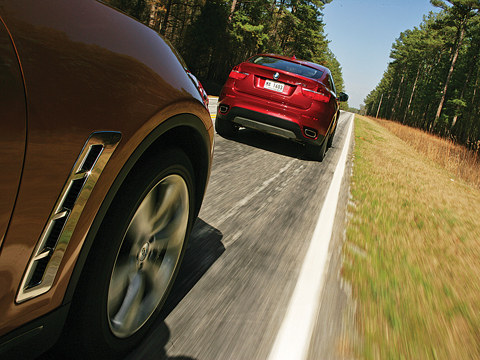 Two extra sporty SUVs – the BMW X6 and the Infiniti FX50 – square off against each other… and the laws of physics.